Think Burrus Blog: Later Planted Early Hybrids - Can they Perform? When recently stumbling across a year-old email from Jim Hughes, I found information worth sharing with our growers. Knowing your genetics is key; for example, early hybrids could work well for a late planting in terms of not only yield, but ability to finish. Power Plus® 2F91™* is a recommended early hybrid example from our line-up. Strong northern corn leaf blight (NCLB) tolerance. As you push grain fill later in the season, conditions for NCLB become more favorable. Strong late season stalk health or staygreen. Hybrids that tend to "die and dry", seem more prone to premature death when planted late. The 105 day (mid-season at Woodstock) has delivered the highest yield across years on average. 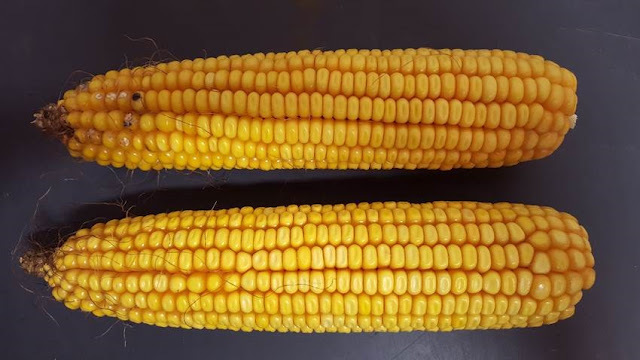 Both ears shown below are Power Plus® 2F91™*, but were planted at different dates (May 6 and June 2) in the Woodstock, IL plot in 2016. Top ear: June 2, 2016 planting date. Bottom ear: May 6, 2016 planting date. Notice the overall ear size is pretty close, with no tip-back. The kernel depth of June 2 is pretty close to May 6 as well. Top kernels: June 2, 2016 planting date. 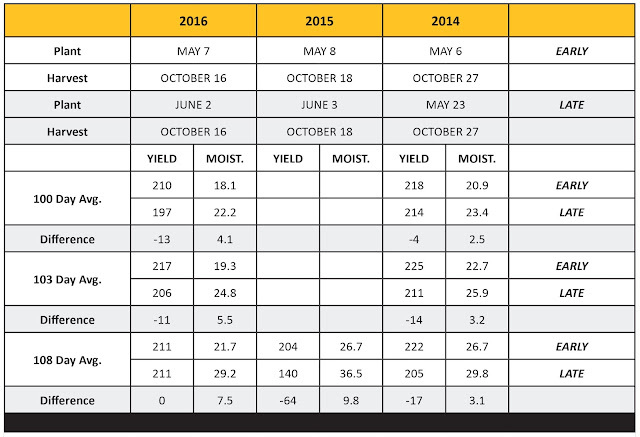 Bottom kernels: May 6, 2016 planting date. The main difference is that the corn planted on May 6 had just black layered in this picture, while the corn planted June 2 had one or two weeks until maturity. Below are the whole-trial yield and moisture difference between normal and late-plant at Woodstock during 2014, 2015, and 2016. As you can see, there is still a lot of yield potential with a June 1 planting date. The big differences occur during critical growth stages, such as pollination. 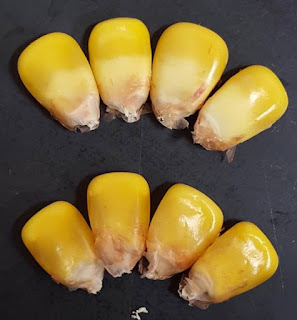 For example: in 2012, the late planted corn was much better, because it flowered after the brunt of the heat and drought broke, thus it had a much better seed set and grain-fill opportunity. Later planted corn was significantly worse due to lack of moisture late, combined with crushing late disease pressure. 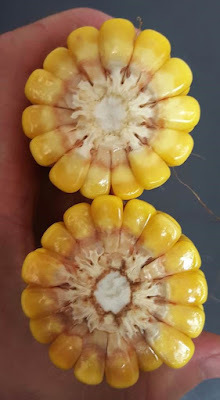 This is when fungicide can be very important for later planting corn, but the further reduction in dry down does need to be taken into consideration. In 2014 and 2016, without a strong bias to early or late, there was only about a 5-10% yield penalty for the later planted. One huge asterisk here: these late plant trials were intended to be planted late, and went into ideal conditions. Corn mudded in on June 1 is still corn mudded in. We know the penalty from improper seed bed conditions can be severe, regardless of planting date.